Wait, we should be maxing out our 401k’s? I haven’t written for a while because things have been hectic here in the Clever Dude household! We’ve had some health problems in the family this year, and some major home projects, and I’ve been enjoying Brock’s different perspective on finances, family and other topics. I hope you have too! And that’s because I’m not even close to an expert in either, and giving the wrong advice could land both you and I in hot water. So generally, if I’ve talked about either, it’s only what I’m doing with either category. For all the years I’ve been writing here (over 7 as of this summer), I’ve seen many other bloggers writing about maxing out your 401k contributions. However, I’ve never done it. But this year, since we’re debt-free, other than the mortgage (which right now, thanks to the variable rate, is super low), so I had to figure out what to REALLY do with our extra monthly income. Some months, I pay down extra on our mortgage. Others, I send to our savings account. 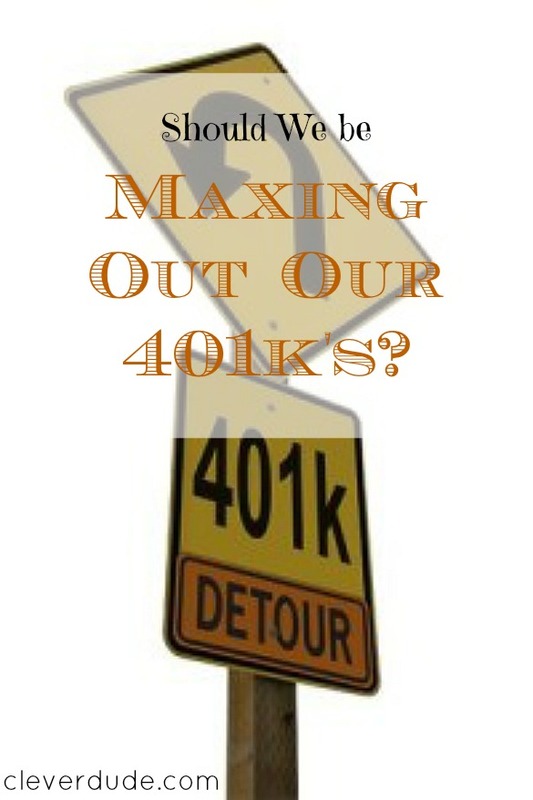 But recently (and perhaps too late), I decided we should max-out our 401k contributions this year. Easier said than done considering the max per person right now is $17,500. That’s $35,000 for the both of us that we can contribute (plus employer matches) to our 401k retirement accounts. For many of you, that’s as much or more than you make in an entire year. But thanks to hard work, luck, perseverance, a God’s good graces, we’re making enough that we can finally and truly max out our yearly contributions. Too bad I decided it halfway through the year! Actually, I planned early this year to try to max out my own contributions, which is somewhat difficult since I’m not paid on part salary/part bonus rate, and they take contribution %’s out of my bonus pay too. That means I can’t just say “I’m making X this year so my contribution amount is Y”. I don’t want to put in too much, but I don’t want to come up too short. But I’m about on track to max out for my contribution my year-end. But making the change for my wife’s pay wasn’t as easy. She makes quite a bit less than me, and I also waiting until halfway or more through the year to try to max her 401k as well. Another difficulty was that she’s changing companies at the end of this month, and that means an all new 401k plan and administrator. Long story short, her company and another company combined money and where she works broke off into a new company with all new benefits, pay (she finally got a big raise!…when the new company takes effect) and 401k vesting timeline. And since no one seems to be able to answer some basic questions like “what is the matching amount” and “when does she vest”, when the new company is supposed to start at the end of this month, I decided to try to max out her contributions to her existing plan. The maximum we can take out of her pay is 50%. That’s a big chunk, especially with some major home improvements coming up and some side-projects taking a bit of a chunk out of our savings for now, but we’re committed to it. Too bad she’s going to be $thousands away from the max by the time her current paychecks end, and I haven’t even found out how to enroll in the new 401k! But at least we’ve realized (rather late) that we should be sending what we can to pretax investments. It’s a crapshoot whether to pay down our mortgage or save towards retirement because you know the mortgage rate now, and you can’t know the return rate on your investments. If you did, you’d be on a beach never thinking about work again. But there is also a major tax advantage to pretax contributions (i.e. deductions and a bigger tax refund). I usually plan for no refund or even owing money, but this works, I’ll finally start getting money back each year rather than owing to both the feds and state. To me, it’s better to owe because you got a chance to earn or avoid interest when YOU have the extra income versus the government earning interest on your money, but for this year, if we get a sizable return, it would be a pleasant surprise and go towards a worthy goal (mortgage, remodel, savings or maybe a really nice trip). So if you can, try to at least get close to maxing out your 401k, even if you don’t get an employer match. And if you don’t have a 401k, then open up a Roth IRA and contribute. The earlier you start investing to one or both, the more you’ll end up with when it’s time to retire! (Disclaimer: Assuming you make money, not lose it!). Who else is maxing out their 401k or even Roth IRA each year? How does it affect your finances and budget? I don’t have access to a 401k but I did max out my contribution to my Roth IRA this year. I actually made most of the contributions for last years Roth during this calendar year as well. That’s about $10,000 I’ve saved so far this year which is pretty good considering I’ll only maker $25,000 or so for the year. I’ve maxed out my 401(k) and Roth IRA for the past 5 years. I’ve been contributing 20% to my 401(k) ever since I started my job, and thanks to pay raises and a lot of overtime, 20% of my pay now exceeds the contribution limit. My company does a 50% match on the first 6% of employee contributions for each paycheck, so once I hit my limit, I contribute 6% of my pay to a post-tax account (which isn’t tax-advantaged but allows me to continue to collect the company match for the rest of the year). The $17,500 tax deduction also reduces my MAGI enough to make me eligible to contribute the maximum to my Roth IRA.